Musician and philanthropist will.i.am says investing in education can create ripple effects and raise awareness on entrepreneurship. COLLABORATION. 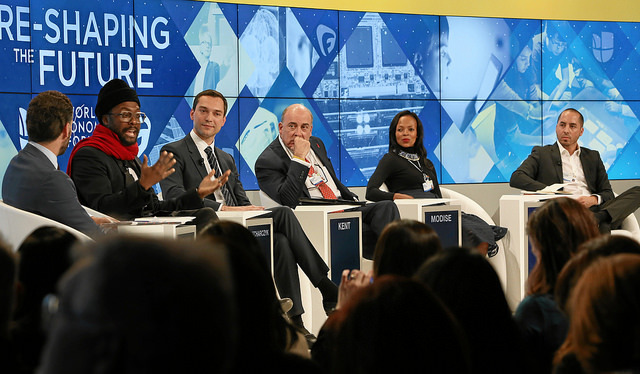 Panel members of 'The 21st-Century Dream' forum at the Annual Meeting 2016 of the World Economic Forum in Davos, Switzerland. From left: Mexican journalist Enrique Acevedo; music producer will.i.am; Airbnb's Nathan Blecharczyk; Coca-Cola Company CEO Muhtar Kent; entrepreneurship activist Matsi Modise, and Recarga.com’s Rodrigo Teijeiro. Photo by Monika Flueckiger / World Economic Forum. Education was the focus of the “21st-century Dream” panel during the third day of the recently concluded World Economic Forum (WEF) held in Davos, Switzerland from January 20 to 23. The panel discussed how corporations and businesses can prepare for the Fourth Industrial Revolution, and how today’s communities can run tomorrow’s enterprises. The WEF defines the Fourth Industrial Revolution as “developments in previously disjointed fields such as artificial intelligence and machine-learning, robotics, nano-technology, 3D printing, and genetics and biotechnology,” which are expected to disrupt businesses and labor markets in the next five years. Mexican broadcast journalist Enrique Acevedo moderated the diverse panel comprised of Airbnb co-founder Nathan Blecharczyk; William Adams, more popularly known as music producer will.i.am; Coca-Cola Company CEO Muhtar Kent; entrepreneurship activist Matsi Modise; and Recarga.com’s Rodrigo Teijeiro. The Internet and smartphones are two key game-changers in the business scene, and that moving forward with these technologies will equip today’s generation with skill sets to run businesses in the future, Tejiro added. LOSING JOBS. Data shows that 7.1 million jobs could be lost in the next five years, with white-collar jobs suffering the most. Photo from the World Economic Forum. Coca-Cola’s Kent said that “the golden triangle,” namely the government, business, and civil society, could bridge the gap in accessing opportunities, especially in developing countries. “We just need to find and pave the way for this golden triangle to solve these disparities now. The solution lies in creative partnerships utilizing technology,” Kent added. 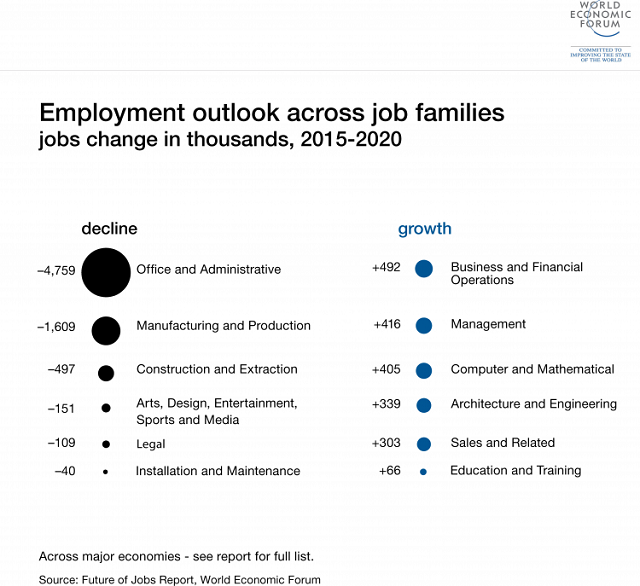 In WEF’s latest report titled “The Future of Jobs,” data shows that 7.1 million jobs could be lost in the next five years, with white-collar jobs suffering the most. Music producer will.i.am, who launched his own fashion tech company iam+ in 2014, said investing in education can create ripple effects not just in poor communities across the globe but also in raising awareness on entrepreneurship as well. “I’ve been teaching kids from the ghetto how to do robotics, and if we scale that and bring it to Africa, the Philippines, or South America, then we can think the unlikeliest candidates can participate in shaping the world with tomorrow’s skill sets,” will.i.am said. Modise echoed the suggestion as the activist shared how people in Africa are still in the Second Industrial Revolution, and how catching up with the rest of the world would be a tremendous challenge. “I don’t want to think of playing catch-up with the rest of the world. What I want to focus on is how young Africans can lead the next industrial revolution, not leap-frogging,” Modise added. Airbnb’s Blecharczyk said the millennials’ new expectations in the workplace are urging businesses for this inclusive growth, as these young professionals believe in working with a purpose. “Young people believe in working on things they love, and things with a purpose. If a company starts to campaign these issues internally, then they can pursue those in external endeavors,” Blecharczyk added.